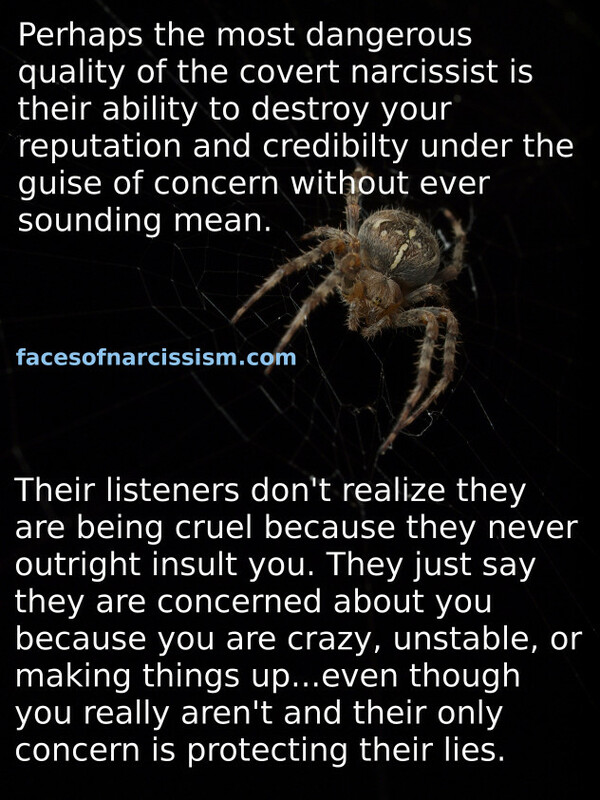 Perhaps the most dangerous quality of the covert narcissist is their ability to destroy your reputation and credibilty under the guise of concern without ever sounding mean. Their listeners don’t realize they are being cruel because they never outright insult you. They just say they are concerned about you because you are crazy, unstable, or making things up…even though you really aren’t and their only concern is protecting their lies. Joanna that is absolutely true. I’m fortunate the narco in my life is only my sister – but she has caused so much hurt to me & the rest of the family. A large part of that hurt has been her ability to make us distrust each other – but I think we are finally getting on top of that through talking a lot more to each other. Also assessing who we are – in my case I now think the liar & manipulator has been exposed. I also have a professional job & for 10 years I was either afraid or too embarrassed to tell to tell colleagues, agents, contacts even clients about this personal problem in my life. I think holding it all in, the pressure just grew & in the last year I’ve let it out. Fortuitously I’ve found that in the small Welsh community where I live, it seems the narc had already been widely identified & I have received a lot of support. I know that’s not always the case. It’s been such a journey of discovery for me learning that my sister, who was always a difficult person to adjust to, is actually a far more sinister character than I ever knew. I feel a bit stupid having not identified her true nature until I was around 55 years old. But following your site I note that most contributors are women who have suffered in a relationship with a narco. Knowing how I feel, having been deceived & manipulated by a sister for so many years, I cannot imagine what it’s like for your lady followers who have given their life, love, trust & body to people like this. My experience has, I suppose, been bad but manageable. Knowing what I now know my heart genuinely goes out to you & the other ladies on your site who have no doubt been affected in a far worse way, through a much closer relationship, than I have. Chris your experience with your sister is almost exactly my own. Right down to discovering the entire awful scope of her decades long sinister ugliness at the age of 55! Thank you for posting your post! Chiming in with Chris Rowley, I have grown up in a complex of narcs. This has socially (and physically) disadvantaged me many ways. I am still kicking, but it is very hard to live every day with all those disadvantages, and still to believe I can have a life. My last narcissistic encounter (yes, with a never-been-your-boyfriend) has pretty much screwed me out of ever having a child, and into years of legal battles, and into at least a couple of years of not being able to live with the one non-narc in my life.